Today started out the opposite of yesterday. It looked like it was going to be a rainy day, but as we hiked into Fontana, the weather warmed up and we had one of the best days weather-wise since our first few days in Georgia. As we got close to Fontana and our short hiking day of 6.6 miles, Mamaw B met up with us! We met her last August during one of our practice hikes in the Bigelows. We talked briefly on the trail and we thought we would never see her again. She was close to finishing, so we always wondered if she had made it. When Mamaw found me on trailjournals, we were surprised and excited to hear from her and that she had finished her thru-hike. She offered to help us out when we got near the Smokies, since she lives in Tennessee. We had a great time talking about the trail and she had lots of funny stories about her thru-hike last year and an abundance of good advice. We slack-packed for the first time from the road crossing in Fontana to the shelter. Mamaw took our packs in her car and we made a quick hike over to the shelter along the lake. We flew down that trail without that 30 lbs on our backs. Mamaw also made us an amazing lunch and man did we eat that up! Not only was it good food, but it was healthy too. And I didn’t realize ’til I was eating it, how long it had been since I had eaten a healthy meal. She made us pork tenderloin sandwiches, strawberry and spinach salad, roasted vegetables, tabouleh (not sure if I spelled that correctly) salad, and brownies. Not to mention that she also brought along fruit, juice, chips, and even Easter baskets filled with dyed eggs and chocolates! It reminded me of home and dying eggs with my sisters and my parents hiding our Easter baskets somewhere in the house for us to find. We couldn’t have asked for better trail magic today from Mamaw B. We are staying at what is known as the best shelter on the trail. With room for 20, the Fontana Hilton is a dream shelter. Water fountain, clean shelter, hot showers, bathroom, trash cans and plenty of room to hang out, it’s a great place right on Fontana Lake. It doesn’t take much to please us out here! We’re staying with mostly people we haven’t met before and even two guys who are finishing their SOBO hike. 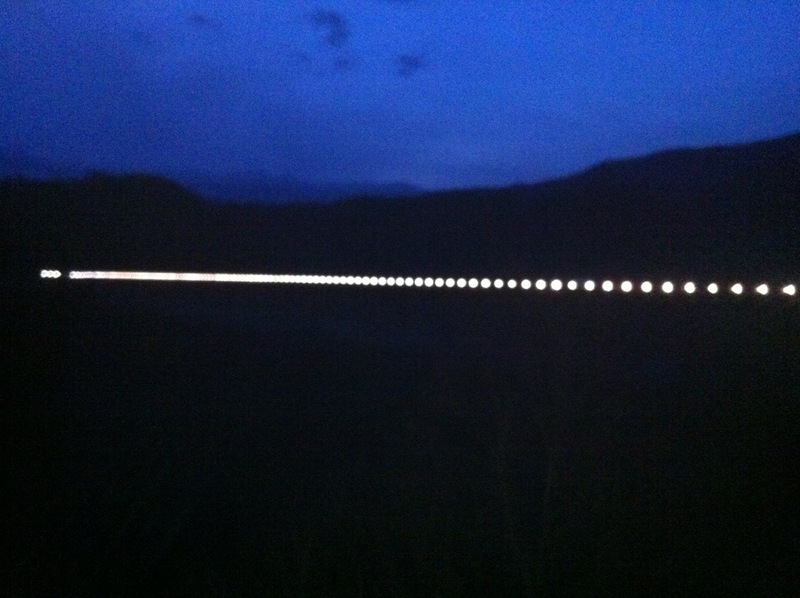 We all walked down to the dam tonight to see it all lit up. It was really awesome to see at night. A TVA project built in the 40s, I believe I read that it’s the biggest dam east of the Mississippi. It’s a warm night here and I’m enjoying sleeping in my shorts for once. We’re heading into the Smokies tomorrow where it’s bound to be colder and snowy. Supposed to rain tomorrow, so we’ll see how our big ascent into the park goes. We’re warm, full from amazing food from Mamaw B, and clean from our hot showers here at the Hilton. Not sure how reception will be in the Smokies, so you may not hear from me in a few days. Wish us luck…we may need it up there! Can’t believe it. Last year about this time my daughter and I hiked for a short spell with Mamaw B. We were section hiking Wayah, she was on her way to Maine. I’m so glad to hear she made it. She’s an inspiration and I tell a lot of people about the time we hiked with Mamaw B. I believe she was hiking with a fellow named Mad Hatter at the time. Enjoy the Smokies! That’s awesome! We love Mamaw B, she’s a pretty cool person.